This striking hand carved 6-panelled cabinet in Jodhpur blue has been handmade by skilled artisans in Rajasthan. A remarkable looking tall cabinet, striking in a colour of Jodhpur blue, this piece of Indian furniture has a door with six hand carved ‘sunburst’ motifs on adding to its stunning look. 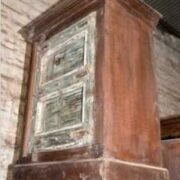 In addition, the cabinet has further skilled crafted carving throughout its surround. Hewn from native Indian timbers revealing extraordinary artisan craftsmanship this cabinet is quite some piece with a history in Chincharli west of Jodhpur.